The finished gauge. I should probably chamfer the ends of the arm a bit. 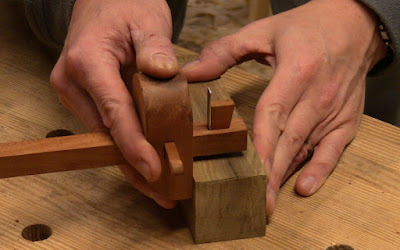 Bob Rozaieski recently did a very nice video blog post on making Dean Jansa's marking gauge from the December, 2006 issue of Popular Woodworking. I remembered wanting to build that gauge then; this finally gave me the kick to do it, so I dug out my old copy. However, I ended up making one change. The original was a pin marking gauge based on one in the Seaton chest, but I turned it into a cutting gauge instead, for several reasons. 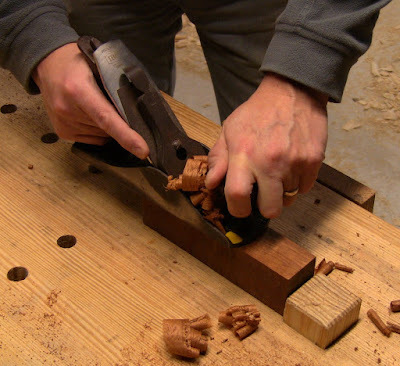 The first was watching Steve Brown of the North Bennet Street School on an epsiode of Rough Cut, where he and Tommy Mac built a "Shaker-inspired night stand." 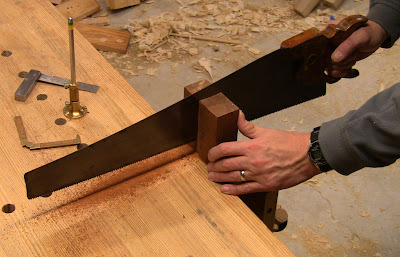 Steve marked out the leg mortises with a cutting gauge, and it was beautiful to see how smoothly the gauge flowed along the wood as he pulled it. He also had a particular way of holding it that I'll come back to. Second, in Ian Kirby's The Complete Dovetail , he strongly recommends a cutting gauge rather than a pin gauge, due to the clean cut line. He pushes it, using an overhand grip. 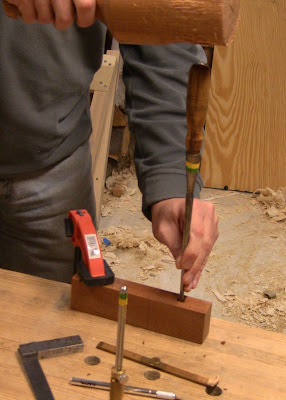 Finally, I met Matt Kenney, Fine Woodworking associate editor, at the Lie-Nielsen hand tool event at Phil Lowe's Furniture Institute of Massachusetts last Friday, after I had already started making my gauge. He had a bench setup with grooving planes, gauges, and bench appliances, all of which he had made. His gauges were cutting style, and he said he made the cutters from sabre saw blades with the teeth ground off. As I was admiring them, I decided to adapt the one I had in progress to a cutter. So yes, it took inspiration from five people to get me to make this gauge. 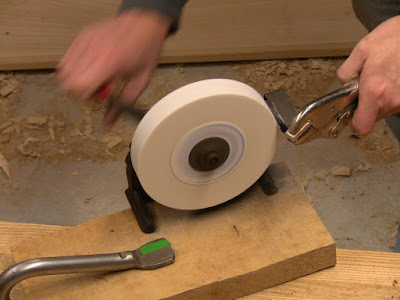 This is a good project for using up scraps. I had a few small scraps of mahogany, so used those. Mahogany probably isn't the greatest wood for a gauge due its relative softness, but as I started working it I was reminded once again what a fabulous material it is. It works like butter. Ripping the piece for the head. Final smoothing to width with a #4. Resawing to thickness. The waste will provide the wedge stock. 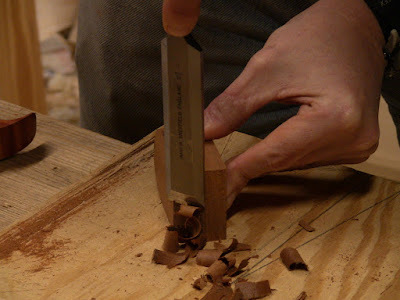 Chopping out the tapered wedge mortise. Final cleanup of the mortise with a plane float (which is meant for a different kind of wedge mortise, but it's the same operation). 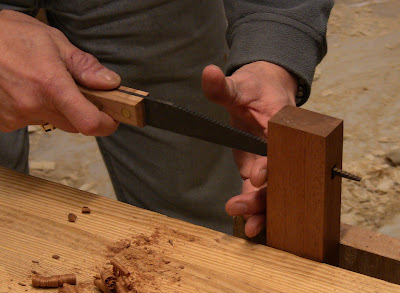 Chopping the arm mortise. I didn't have a 5/8" chisel, so I did it with a 3/8". Ripping out the arm piece. Final very careful smoothing of the arm. I still managed to get it a little too thin, so there's gappage in the mortise, but the wedge locks it tight. Grinding the teeth off a sabre saw blade. I sanded the paint off the sides, put a round profile on the end per Kirby's recommendation, and sharpened it up on oilstones. Mortising the arm for the cutter and wedge. This is getting pretty delicate, so the machinist's parallel clamp prevents splitting. After hogging off most of the waste with a chisel, tapering the wedge by running it over the bottom of the #4. Just watch those fingertips! 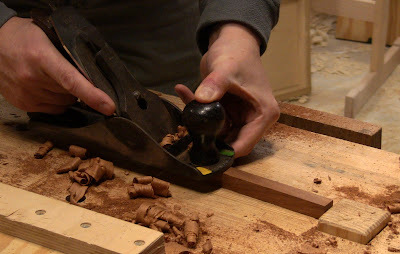 Final delicate paring on the bench hook to shape the wedge with a little finial at the end. Roughing out the curve on the head with a chisel. Final shaping with a cheap four-in-hand rasp. 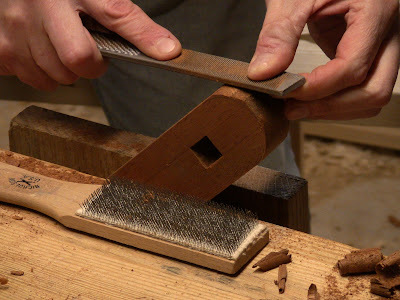 The file card on the bench is necessary to clean out the dust in the rasp's teeth periodically. Last step before wedging it up is to pare down the bevel on the bottom edge of the head. I may have to remake the arm wedge. I ended up paring it down a little too much, so when I push it in to lock the arm, the wedge goes almost all the way into the head. 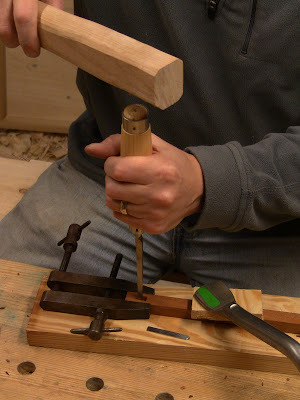 When I loosen it, the finial is too small to keep the wedge in the head; it can fall out if I'm not careful. Now, back to the way Steve Brown used the gauge. He held it in an underhand grip, thumb on top, the arm between first and second fingers. 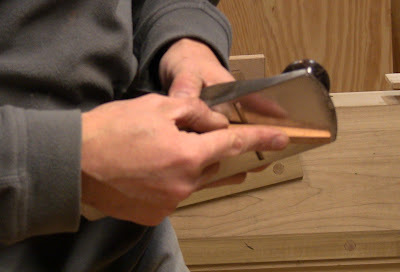 The fingers curl around the bottom bevel. Marking out on some scrap for practice. Smooth! 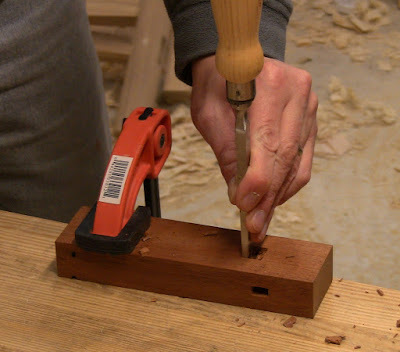 This is very comfortable, but more importantly, as you draw it back along the wood, your fingertips press the bottom bevel against the side face of the work, while your thumb presses the gauge down on the top face. This gives very smooth control, even if the grain tries to carry the gauge off course. With a sharp cutter, the result is a crisp clean line. Very subtle, but very effective. I tried it with the bevel on the cutter oriented both ways, toward the head and away. 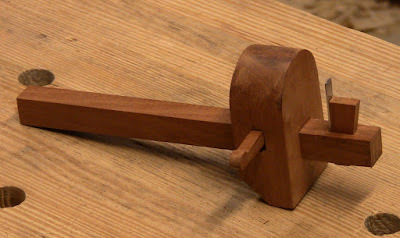 It works best with the bevel facing the head, due to the wedging action of the bevel drawing the head against the work. 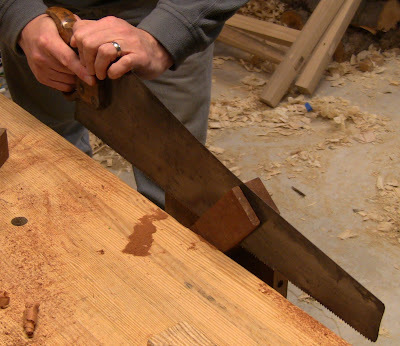 That's good for rabbets, fillisters, dovetail baselines, and tenon shoulders. 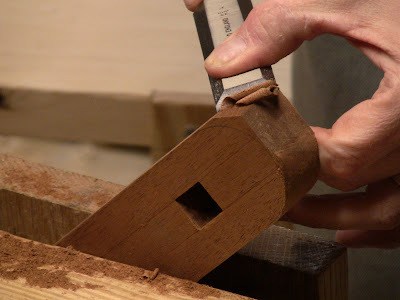 However, for mortise outlines, bevel away from the head is better. Depending on the operation, put it on the waste side of the line, leaving a flat cut on the good side. Dang! That sure is sweet Steve. Now, you're makin' me go down to the shop and revise the Jansa style gauge I made some time ago. I never quite liked the roughness of a pin. Gotta make it cut. Nicely done Steve! 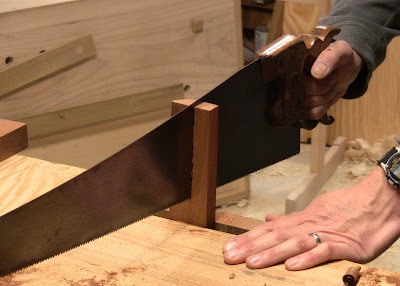 FWIW, these styles of gauges are nice for cutting veneer and stringing as well. Thanks, guys! While I haven't used a wooden cutting gauge before, just the metal Tite-Mark, I really liked the feel of using this one. Well done, Steve! That sabre saw cutter is a good idea. I never was happy with the pin in the gauge that I built (and the arm never fitted perfectly), so I think I'll just build another arm with a cutter instead. I like that detail with the wedge holding the cutter, btw.